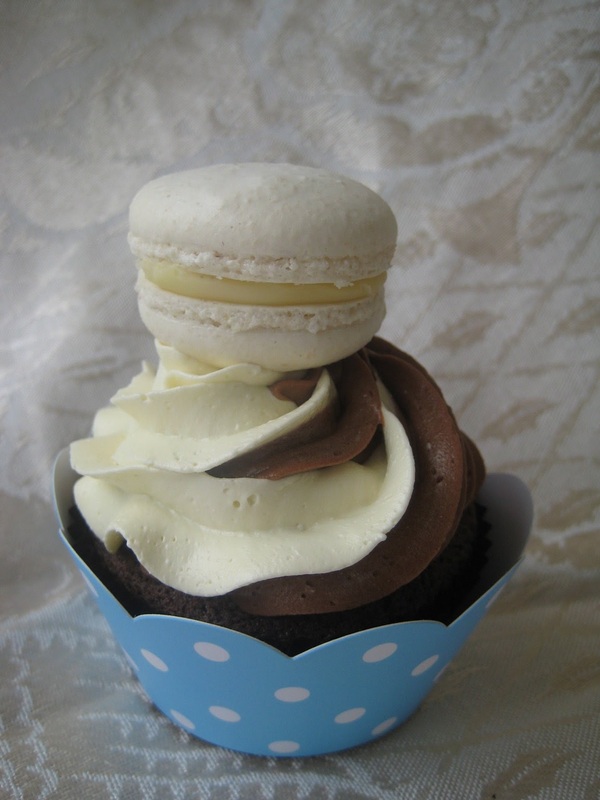 MacCakes - no this isn't something you get at the golden arches. It's what I'm calling my cupcakes topped with macarons that were a result of some yummy leftovers this week. Oh and check out the two tone topping. I've had it in my head to make some macCakes for a while and then I spied something very similar to these on one of Butter Hearts Sugar post. The pink two tone twirl on that site was so sweet. My two tone macCakes were just meant to be. and you know when your serving leftovers you have to jazz it up a bit so I added some gorgeous cupcake wrappers from The Cupcake Wrapper Co to pull the look together. 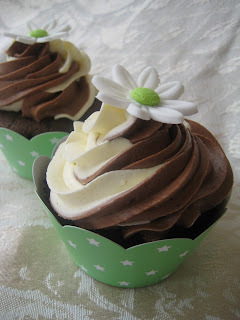 and just because I had some green cupcake wrappers as well I did these ones with the flowers as well. 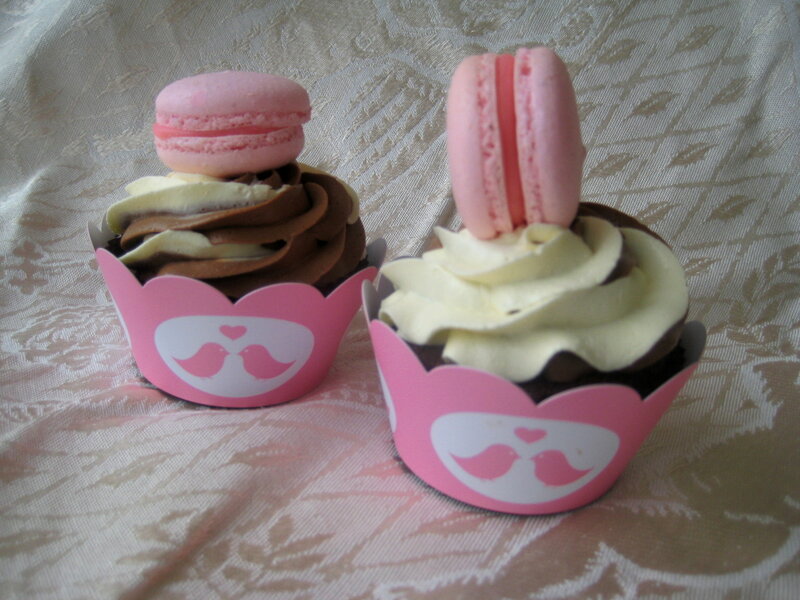 Oh these made me so happy, I loved the chocolate buttercream with the macarons. I had even more macarons left and ended up piping a little star of the two tone buttercream on the top of all of them. No pictures of these as I ate them way too fast. 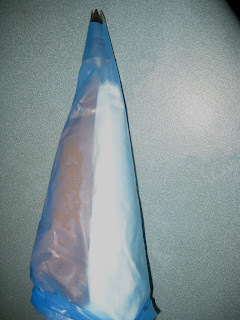 There are a couple of ways to do a two tone frosting, you can just pop the 2 different frostings into the one piping bag and hope for the best, or you can do what I did and pop each frosting into a separate bag, then pop those 2 bags into another bag with a tip. Usually ends up more even and with less smudging. Ooops filled those bags a little too much, remember to under fill them a little as they will be getting squished in with another bag. I piped onto the counter until I had the swirl coming through evenly and then it was easy peasy. Ooh these look yummy! I love how perfect the 2 tone is, aha I used the hope for the best method. Lovely clicks Linda. Good recipe. Icing makes it look cute and yummy. Such a clever idea, i never thought of putting the two bags in another bag!! Ill have to try that sometime!! Your cupcakes look amazing :D.
Very cool idea with the two bags inside one for the perfect swirl. Gorgeous cupcakes! so lovely, so well thought and amazingly executed! fabuloous cupcakes! What a fun idea. 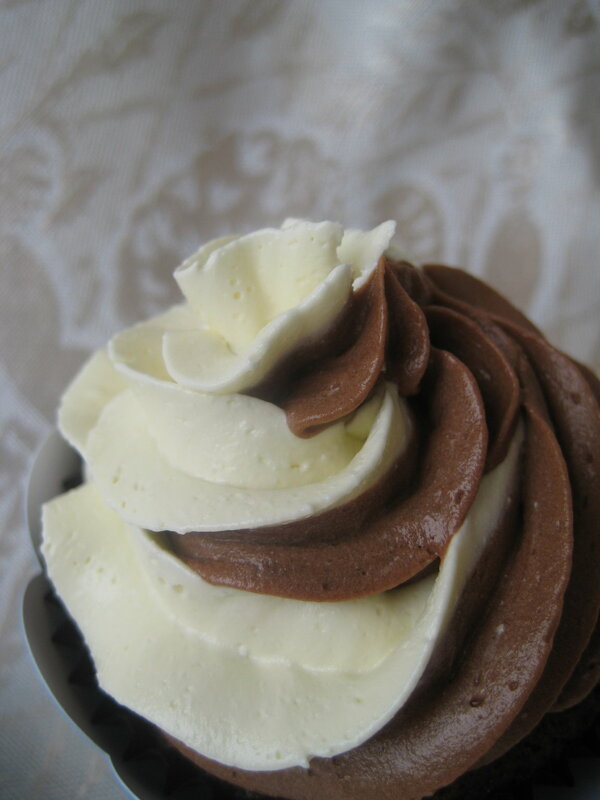 Swirlalicious cupcakes would be a hit at my house. These look good - 2 yummy things in 1! Wow - that is gorgeous and so clever... I love the two tone. Thanks for the tip on how to do the two tone swirl! I'm so excited to try it out! Your cupcakes are SO pretty! I love the MacCakes...what a cute idea, and your little macs are perfect! Ooh, these are beautiful. Your whole blog is just so gorgeous I want to eat it up. Maccakes are a great idea. I actually saw someone do mac-tartelettes this week too. 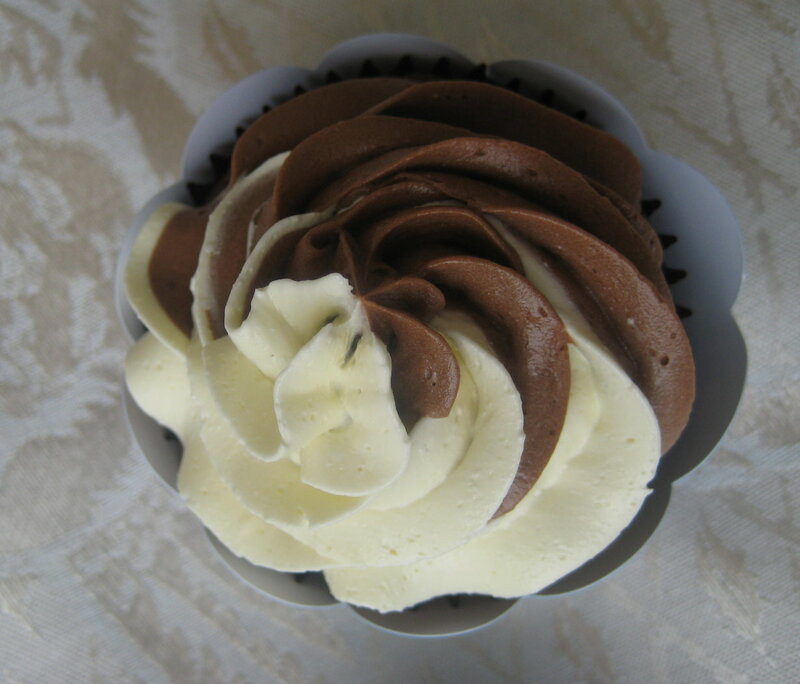 I love your two tone swirly piped frosting on those pretty little cakes. Very clever. Your leftovers are much better than any you could find in my kitchen. Great post! I just had to add this to my blog!